In 2014 the Commonwealth Games were held in Glasgow. 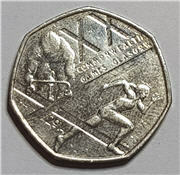 This coin celebrates the games and shows a cyclist and a runner, separated by the Flag of Scotland. Reverse was designed by Alex Loudon and Dan Flashman. Mintage: 6,500,000 (may include coins issued as part of a set). Minted at The Royal Mint. 50 Pence Coin - The Glasgow 2014 Commonwealth Games. Rare Coin!